In February of 2003, over 35 world famous winemakers united at Napa's Stag's Leap Wine Cellars to celebrate having "lent a hand" in crafting the vineyard's success over the decades. Each contributor pressed one of their hands into a limestone mold, each of which is now on exhibit at the Stag's Leap winery. 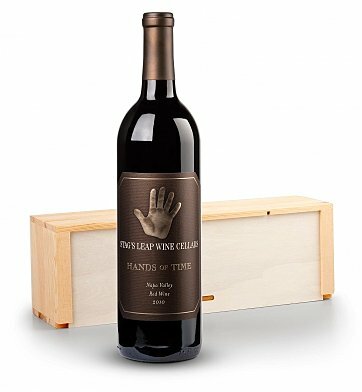 The exclusive label Stag's Leap Hands of Time features an impression of one of the hands that forged the elegant and balanced Stag's Leap wines. One bottle each of Stag's Leap Hands of Time Red Blend. For more information on this wine, please see the Tasting Notes. Stag's Leap Hands of Time Red Wine is a hand delivered gift. These gifts are delivered by one of our local design centers located throughout the United States and Canada. Same day delivery is available for most gifts when ordered before the cutoff time. The cutoff time for Stag's Leap Hands of Time Red Wine is 1 PM in the recipient's time zone. Stag's Leap Hands of Time Red BlendCombining two of the world's most popular varietals, this Cabernet-Merlot blend features a nose of nutmeg and cocoa while mingling warm vanilla tones with a wisp of fresh berry and spice. Stag's Leap Hands of Time Red Blend with Exclusive Mentor Label. Presented in GiftTree's signaure durable wooden crate. Cannot comment on the content as these were gifts for our clients. However, I was very pleased with the way everything was handled and especially the notifications when items were delivered.